For some people making a simple promise is a commitment, and it holds a deep importance. They can become truly hurt if someone breaks a promise, and have a hard time trusting that person. For others a promise can sometimes be hard to follow through with, since they intended to keep it but might become a bit distracted later on. 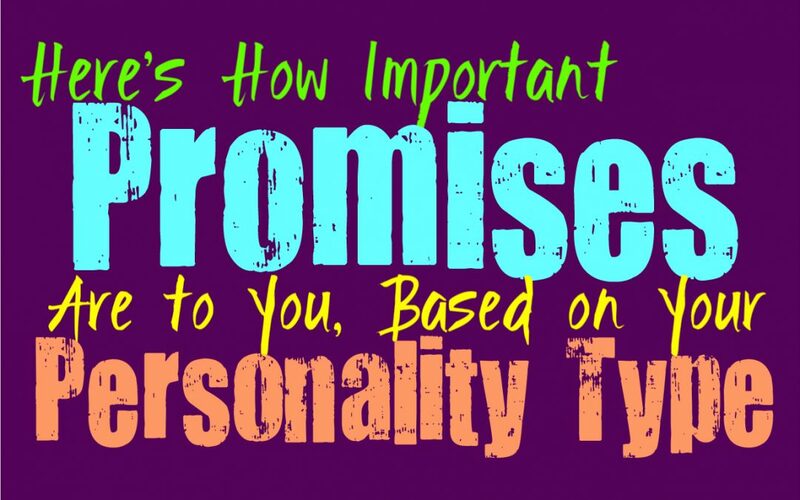 Here is how important promises are to you, based on your personality type. INFJs often believe that their promises and their word is truly important and valuable. They don’t say things unless they mean them, and certainly won’t make a promise that they don’t intend to keep. If the INFJ makes a promise to someone and following through becomes difficult, they simply work harder to get it done. They won’t just back out because things become challenging, and will do whatever it takes to ensure that they follow through with their commitments. INFJs become truly hurt when people promise them things and don’t deliver, and can feel sincerely betrayed by this. ENFJs certainly value the importance of promises, and believe in doing everything they can to uphold their commitments. While for some a promise isn’t the most serious way to agree to something, for ENFJs it holds great importance. They believe in doing whatever they can to keep up with their promises, especially when it comes to their loved ones. They don’t like disappointing people and will feel like a failure if they haven’t been able to keep up with some of their promises. ENFJs also become deeply hurt when their loved ones cannot seem to follow through with the things they promise. INFPs definitely believe that making promises means you should do everything to uphold them. They can become deeply hurt if someone promises them something but doesn’t follow through. In most cases the INFP will do whatever they can to ensure that they follow through with their promises. They believe in following their internal set of morals, and so to them being someone who is honest and sincere is truly something they must do. INFPs can sometimes become distracted or overwhelmed by too much around them, and in these moments they might fall a bit short of their promises. For them this is a failure that they will struggle with and often blame themselves for. ENFPs definitely believe that promises are important, but they can become distracted and sometimes fall a bit short. ENFPs make promises from their hearts and fully intend to keep them, but sometimes they struggle to really see how difficult it is going to be. They often make promises because they don’t want to disappoint a loved ones and want to avoid discord, and sometimes this can become a struggle that they find difficult to overcome. The ENFP will definitely feel horrible about this, since promises are something they believe to be truly important. For INTJs any kind of commitment is something that should be held as important, which includes making promises to people. If the INTJ makes a promise to someone they love, they believe in doing whatever it takes to follow through. They won’t make a promise that they cannot be sure they will keep and maintain. For them it is important to think things through before promising or committing to something, and just jumping in will seem flighty and foolish. For the INTJ it is important to be able to trust the people in their lives, and so promises should always be kept. ENTJs definitely believe in keeping their promises, especially to their loved ones. They are committed people who do whatever it takes to follow through with what they say. When the ENTJ makes a promise they will do whatever they need to in order to make it happen. They won’t simply make a promise without knowing that they are capable of ensuring that it works out. ENTJs take these commitments seriously and will feel sincerely betrayed if someone they love doesn’t follow through with their promises. INTPs do believe that promises are important, but they can sometimes struggle to keep smaller ones. They have a hard time staying focused sometimes and their minds become distracted by other things. The INTP has such an intense inner world and while they intend to follow through with things, it isn’t always easy for them. They might break promises such as arriving somewhere on time, since they become caught up in something else and lose track of what is going on around them. For INTPs the larger promises are the ones that truly matter, and those ones they will work hard to follow through with. ENTPs do value their promises, but sometimes their minds can become distracted and struggle to follow through with certain things. ENTPs believe in standing by their loved ones and will certainly follow through with the commitments that mean a lot to them. When it comes to smaller promises like arriving somewhere on time, the ENTP can struggle to really maintain these things. They care about others but sometimes their thoughts and curiosity can pull them in so many directions that they become distracted a bit. ISTJs value their commitments and take them extremely seriously, and so any promises they make are going to be follow through with. ISTJs do whatever they need to in order to ensure that they live up to any promises they make. When the ISTJ makes a commitment to others they don’t believe in backing out or failing. They won’t make those promises unless they are sure they can actually follow through and live up to these expectations. ESTJs definitely believe that their commitments are important, and they will do whatever it takes to follow through with them. They work hard to take care of their loved ones and believe that a promise is the same as a commitment. ESTJs won’t make a promise they don’t intend to keep, and for them following through is reflective of who they are as a person. ESTJs are often capable of making things happen no matter what, and so for them failing to make good on promises is just a sign of weakness. ISFJs definitely believe that promises are important, especially when it comes to what they commit to with their loved ones. They care about their loved ones and they do whatever it takes to avoid disappointing them. If the ISFJ promises something they will do anything to ensure that they can follow through with this. For ISFJs it is vital to be there for others and to work hard to make them happy. ISFJs will become deeply hurt if someone they love backs out on a promise, and will struggle to really trust them again. ESFJs take their commitments very seriously, and so they also value following through with their promises. They do whatever it takes to live up to the expectations of others and don’t want to do anything that might hurt someone they love. ESFJs work hard to maintain their commitments and to follow through with any promises they make. They don’t believe in failing those they love, and so for them promises are truly important. ISTPs believe that promises are important but at the same time they don’t make them often. Sometimes ISTPs can have a hard time following through with certain things because they become a bit too distracted. They live so much in the present and follow their curiosity, which is why sometimes they can become too distracted to follow through with some things. ISTPs can make promises with every intention of keeping them, but they don’t always think that far into the future. ESTPs can have a hard time following through with some promises, since they become distracted so easily. They will make a promise with every intention of keeping it in that moment, but they become drawn to something else and struggle to keep up with it. ESTPs don’t always think a lot about the future, and might not realize that down the line this promise will become too difficult for them to really maintain. ISFPs do believe in keeping their promises, but sometimes they can struggle to do this. They try hard to maintain the promises that matter to them, and can do so with the more serious ones. For ISFPs keeping promises can be difficult since they become distracted by other things and don’t realize what they are doing. When they make a promise they have every intention of keeping it in that moment, but they might not really be considering how things will change in the future. For ESFPs keeping their promises often depends on what the actual promise is, and how important it is to them. When it comes to the more serious things and commitments that matter to them, the ESFP will do whatever it takes to follow through. When it comes to smaller promises like keeping secrets or being on time for things, the ESFP might struggle with this. They make these promises intending to keep them, but they can get swept up in the moment and their own emotions sometimes.